Please join us at the 2nd Annual Rosenzweig Memorial Tournament for a night filled with friendship, laughter, fun, and a little bit of competition. Saturday, February 6th at 7:30pm Lake Highlands will come together at USA Bowl and compete as teams for trophies hand-painted by Lake Highlands’ students. This is a great opportunity to enjoy time with good friends and family of all ages. Proceeds from the Rosenzweig Memorial Tournament benefit the Rosenzweig Scholarship which was implemented in 2015 as a way for Joel Rosenzweig’s momentous impact at Lake Highlands to continue for years to come. Toler, Carol. 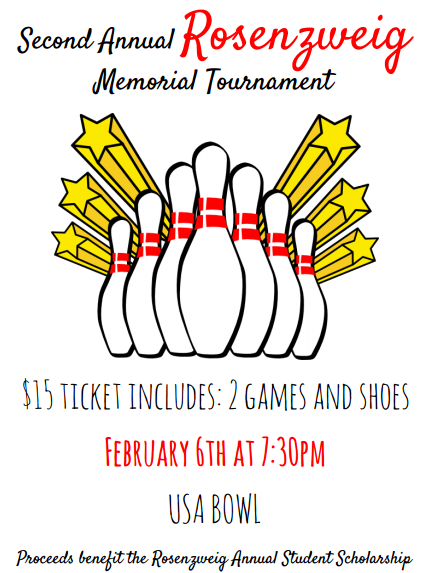 "LHHS Student Council to Host Joel Rosenzweig Memorial Bowling Tournament." Advocate Lake Highlands. Advocate Magazine, 17 Mar. 2015. Lake Highlands HS teacher Joel Rosenzweig passed away unexpectedly in the fall of 2015. He was an influential teacher, sponsor, director, and coach, and for many years, pushed each student to reach beyond what they had believed were their limits. As a symbol of the way he created opportunities for his students, a scholarship fund has been established in his name. Joel held a strong passion for both student government and bowling, so the LH student council and the Alley Cats, are creating a new Lake Highlands tradition - The Rosenzweig Memorial Bowling Tournament, to help fund the scholarship. Donations are also accepted, and can be mailed or delivered to the LHHS Alley Cats, 9449 Church Road, 75238. Please include DL# and DOB on all checks. All proceeds benefit the Rosenzweig Annual Student Scholarship.